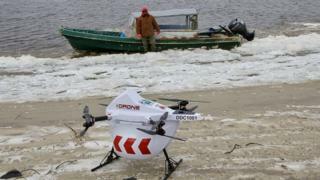 Residents of a remote First Nation island in northern Ontario will begin receiving goods by drone next year. The Moose Cree First Nation has signed a C$2.5m (£1.5m) commercial deal with a drone delivery company to transport supplies, medicine, food and mail from the mainland town of Moosonee. Moose Factory island is only accessible by boat in summer, ice road in winter and helicopter at other times. The drone delivery service will begin next spring, after a year of planning. Drones will have a 5kg (11lb) maximum payload for the roughly 10-minute journey across the Moose River, where there is no bridge connecting the island reserve from its nearest town. "It can be challenging transporting goods, especially during this time of year, when the river is freezing," Moose Cree First Nation spokesman Paul Chakasim told the BBC. "It's really about trying to service communities that lack infrastructure, where basic goods are very difficult to obtain, and when you can obtain them, it is very, very expensive," the head of Drone Delivery Canada (DDC) Tony Di Benedetto told Canadian broadcaster CBC. Stan Kapashesit, Moose Cree First Nation's director of economic development, told the BBC: "It's designed to be affordable and quick, and also part of the goal is to create employment for our community members." Alongside delivering supplies, the drones can also help with monitoring seasonal changes, he said. "It would be ideal to use a drone to monitor river break-ups in the spring, because when we charter a helicopter it can be very expensive by the hour." Eventually, Mr Kapashesit hopes the drone technology will also help them to create a "railway in the sky", first better connecting their own indigenous population of some 5,000 people with essential supplies quickly before then expanding to other isolated First Nation communities. "The possibilities are open now," he said.